Sergi Pujades, Laurent Boiron, Rémi Ronfard, Frédéric Devernay. International Conference on 3D Imaging, Dec 2014, Liege, Belgium. Previz results for a Dolly shot. The actor moves away from the furniture across the room. The difficulty of this shot is to handle the increasing volume of the scene, as the actor moves farther away from the back wall. Moreover, the distance of the actor to the camera decreases as she walks. The pre-production stage in a film workflow is important to save time during production. To be useful in stereoscopic 3-D movie-making, storyboards and previz tools need to be adapted in at least two ways. First, it should be possible to specify the desired depth values with suitable and intuitive user interfaces. Second, it should be possible to preview the stereoscopic movie with a suitable screen size. 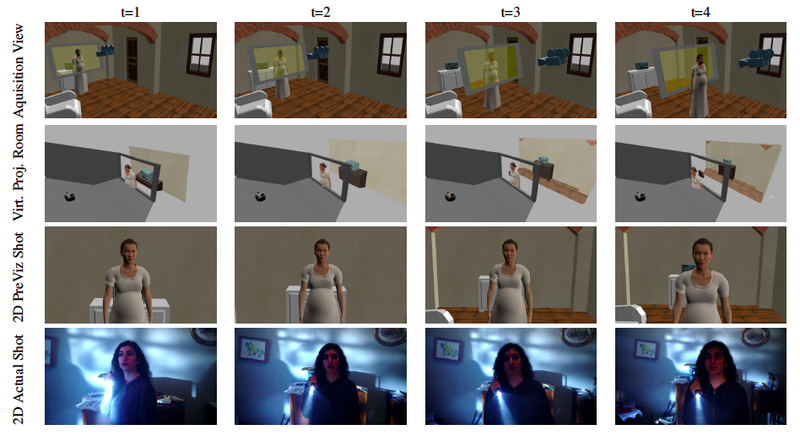 In this paper, we describe a novel technique for simulating a cinema projection room with arbitrary dimensions in a real-time game engine, while controling the camera interaxial and convergence parameters with a gamepad controller. Our technique has been implemented in the Blender Game Engine and tested during the shooting of a short movie. Qualitative experimental results show that our technique overcomes the limitations of previous work in stereoscopic previz and can usefully complement traditional storyboards during pre-production of stereoscopic 3-D movies.